For years now the two biggest stars in the most historic division have yet to see eye to eye. WBC Heavyweight champion Deontay Wilder (40-0-1, 39 KOs) and unified titlist Anthony Joshua (22-0, 21 KOs) have been verbally attacking each other on social media and whenever a camera is in front of them. Although it’s entertaining to the fans, what would be even more satisfying to see them square off. 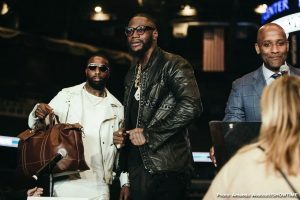 With Joshua making his U.S. debut this upcoming June against Jarrell Miller it seems like the stage is finally set for the two to settle things in the ring. Joshua is of course associated with Eddie Hearn’s DAZN platform and Wilder is a free agent that can do as he pleases. His upcoming fight against Dominic Breazeale is taking place on Showtime but going forward he can return to that network or whichever he chooses. Hearn has recently extended a hand to Wilder and his team to negotiate the terms of a bout with Joshua. It was then reported that Hearn made a substantial offer of 100 million to Wilder for a three fight deal. Those fights would include Wilders mandatory bout against Breazeale and two fights with Joshua. To the surprise of many Wilder and his team turned the offer down. On the outside looking in it is easy to criticize Wilder for his decision to not accept the offer. However once he was given a chance to explain exactly why he did not take the offer it is a valid reason. Finkel would also go to discuss some of the unfairness that took place during the negotiation process. It’s hard for fans to stay patient when this could be the biggest fight in boxing today. Nonetheless take a step back and look at things from a financial standpoint. Essentially he would be getting 40 million for both Joshua fights and 20 million for the Breazeale contest. Finkel went on to explain that although that is a high offer, that the number will only continue to rise and the demands of Wilder would need to be compensated as well. He sure is taking a massive gamble on himself but it is working thus far.